"From my family, from my staff, my program, my university, and for every former player that's here, and the hundreds that couldn't be here, we will never forget you." Michigan State University basketball coach Tom Izzo spoke at Gus Ganakas' funeral Wednesday afternoon. EAST LANSING, Mich. — "From my family, from my staff, my program, my university, and for every former player that's here, and the hundreds that couldn't be here, we will never forget you." 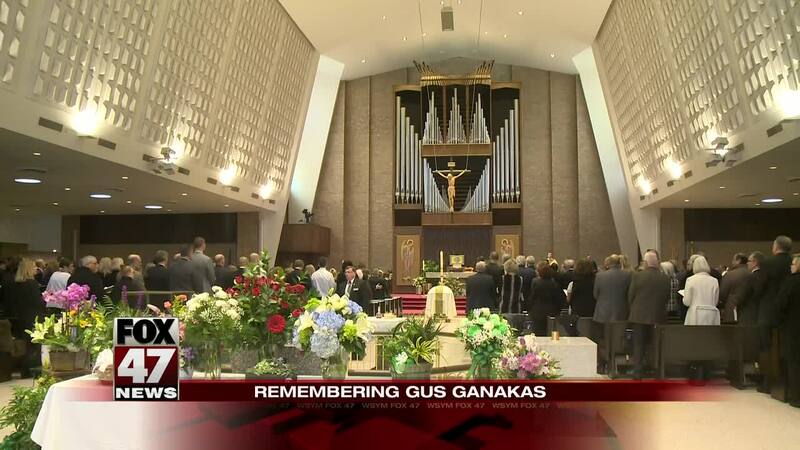 Michigan State University basketball coach Tom Izzo spoke at Gus Ganakas' funeral Wednesday afternoon. Ganakas died last Friday at the age of 92. He was a Spartan basketball coach from 1969 to 1976 and he was a part of the athletic department from 1964 until his retirement in 2000. News 10's Tim Staudt had a very personal relationship with Ganakas and attended his funeral on Wednesday. "Gus was prominent in my life, as he was for so many others. He was a high school algebra teacher and coach; he was a golf partner numerous times in several tournaments; he was a broadcast partner on both television and radio; he was the very first guest on my radio show when it went on the air nearly 26 years ago; and his oldest daughter, Gail, was in my class in high school," Staudt said. There were plenty of laughter and tears during the two-hour funeral. Players from the 1970s gathered at St. Thomas Aquinas Church in East Lansing where the Ganakas family has been a member for years. Many had not seen each other in years. Among those on hand were Gregory Kelser, who nearly transferred from MSU when Gus was re-assigned after the 1976 season in favor of Jud Heathcote and, of course, went on to be a star on the 1979 MSU national championship team. "My parents loved Gus and they wanted me to play for him and that's why I went to Michigan State. I told him four or five months ago he is one of the three most influential people in my life." "It was an amazing two hours, that's for sure, and for a great guy and it's a great loss for me. I tell people I knew Gus before he was somebody and we all laugh about it. But yes he was a great human being."